Boneyard Window Decoration offers a quick and easy way to add scary images to your Halloween scene. 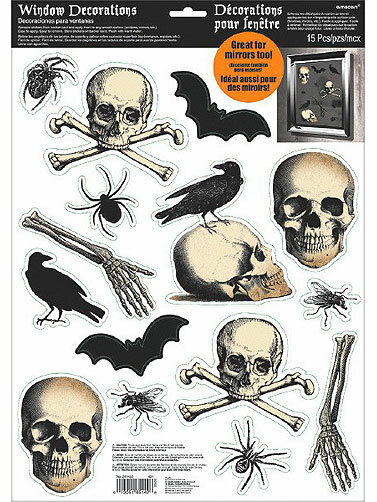 Creepy plastic images featuring skulls, crows, and spiders that adhere to most smooth surfaces without the use of adhesives. Looks great on windows, walls and more. Boneyard Window Decoration includes 15 images printed on one 17" x 12" plastic sheet.